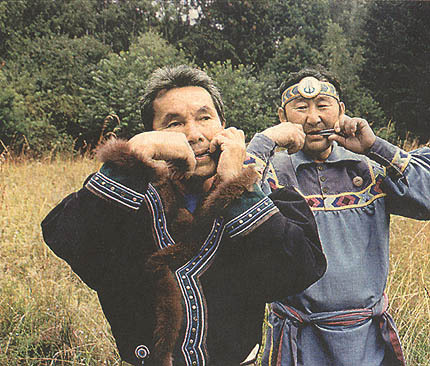 Since around 3000 years the Yakuts express their feelings with the help of the Chomus - the Yakut jew's harp. The Chomus players are respected as wise men, who have exceptional relations to the world of ghosts in the Yakut schamanism. Spiridon Schischigin has specialized on healing with jew's harp playing. Ivan Alexejev is looked upon as the founder of modern Chomus playing. Podewil , Berlin,Germany, September 1999.